Okay I will be the first to tell you I hate the name "Indian Taco". First Native Americans are not Indians because they do not come from India and second I really don't think Natives ate "tacos" per se, but I do love them. I am going to call them Native Tacos, so if you do make them, call them Native Tacos and maybe we can start a good thing. 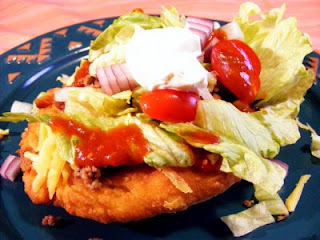 Once you master the fry bread you are ready to make Native Tacos. Practice makes perfect fry bread, just as with any good bread. It is very icy on Beaty's Creek today and this just sounds like a good dinner. Salsa- Paul Newman's Meduim Chunky Salsa is so good! Sift flour and baking powder together, make a bowl in the middle of flour, this is where you will add milk and water. I mix with my hands, I think you get a better feel for the dough this way. I mix until the dough feels like loose biscuit dough. Does that make sense? If not use the comment section to ask me questions. Believe you me it took me making fry bread 10 times before I reached my goal. So don't be disappointed, keep trying! Once mixed together form into disks about 1/4 inch thick and 4 inches across. Heat up oil over medium heat. I place my hand over the oil and can tell if it is ready to add the bread but you can always drop a piece of bread in and see if it sizzles, if it does you are ready to cook your bread. When frying your bread you don't want to turn your bread more than once. I check mine to make sure it is brown enough before turning. This usually happens between 5-6 minutes. Dough should be cooked through and not doughy. I place a couple of paper towels in the bottom of a brown paper bag to soak up any excess oil, and that is where I put my hot fry bread. The bag keeps the bread hot while you finish cooking all the bread. Now is the time to make your taco. I will list in the order we build our tacos. You can make them anyway you want but this is how we do it on Beaty's Creek. Salsa-Paul Newman's Medium Chunky Salsa takes like fresh made!